Preheat the oven to 350°. In a food processor, combine the almonds and granulated sugar and process until the nuts are finely ground. Add the butter and egg and process until creamy, scraping down the side of the bowl. Add the flour and baking powder and process just until a dough forms, scraping down the side of the bowl. Using your fingers, press the dough evenly into a 10-inch fluted tart pan with a removable bottom. Refrigerate for 15 minutes. Line the tart shell with aluminum foil and fill with pie weights or dried beans. Bake the tart shell for about 25 minutes, or until it is just set. Carefully remove the aluminum foil and pie weights and bake the tart shell for 15 to 20 minutes longer, until the shell is crisp and lightly browned all over. Let cool slightly. Poke the sweet potatoes all over with a fork and roast them in the oven alongside the tart shell for about 1 hour, or until they are soft. Let the potatoes cool. Turn the oven temperature down to 325°. Peel and puree the sweet potatoes; you should have about 1 1/2 cups (reserve any leftovers for another use). In a medium bowl, whisk the eggs with the granulated sugar and light brown sugar, salt, cinnamon, ginger and vanilla seeds until smooth. Add the 1 1/2 cups of sweet potato puree along with the heavy cream and milk and whisk until blended. Pour the filling into the tart shell and bake for 20 minutes. 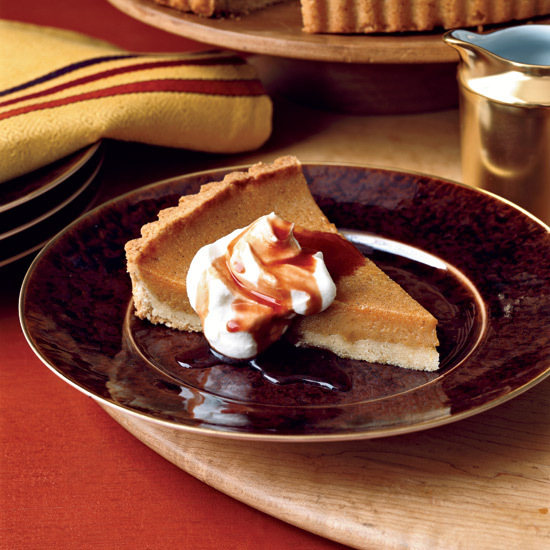 Using strips of foil or a 10-inch pie crust ring, cover the rim of the tart shell to prevent overbrowning. Bake the tart for about 40 minutes longer, or until the filling is set. Transfer to a rack and let cool completely. Slice the tart into wedges, top with the Red Wine Caramel and whipped cream, and serve. The tart dough can be patted into a disk, wrapped in plastic and refrigerated for up to 1 week. The finished tart can be refrigerated for up to 2 days. Review Body: I made this today! I am also that jerk who changed some things (sorry). I used pureed pumpkin instead of sweet potato. For the crust I cut the sugar by two tablespoons, but used toffee mixed nuts and oatmeal instead of almonds. For the red wine caramel, I added a pinch of allspice, salt, and fresh squeezed two tangerines. I also served it with crème fraiche instead of whipped cream. It was amazing! I had extra pumpkin action and through that into a greased ramekin and popped it out crustless for the dieter of the group. SO GOOD.